I just wanted to let the universe know that Ren finally got a cell phone--not that I think he will use it all that much. He famously avoids texting and shies completely from social media, so I don't anticipate major waves of change here. Still, it's good that I won't have to worry about him when goes out of town on his own or when he's at the doctor with one of the kids or we are trying to execute a rendezvous. The additional cell phone may even help us avoid fiascos like the 2014 Chicago weekend trip when we lost each other for nearly an hour despite the fact we were only 100 feet away from one another. And who knows, maybe we WILL communicate more so that we don't both make trips to the grocery store only to awkwardly run into each other in the vegetable aisle. Yesterday, for example, he called me from the Red Box kiosk and then Face Timed with me when I was trying to eat lunch. That's two times more than I usually talk to him during any given work day. This particular lifestyle change happened nearly a month later than planned due to my misguided attempt to change cell phone carriers. I am too tired to do justice to the rant I'd like to write about Verizon, but it was HORRIBLE. First, they sent us the wrong phone, and even though I realized the mistake had happened almost immediately and called Verizon right away (well before the phone shipped), I was told my only option was to wait for the wrong phone to arrive and then return it to the Verizon store. So, I waited dutifully. But, when I went to the Verizon store with my unopened phone, an associate there told me the phone couldn't be returned in person. She also told me the phone we wanted was backordered for three weeks but that it didn't matter since we couldn't get one anyway--what seeing as how we already had a Verizon phone and all. That less-than-helpful associate also told me my other phone was set up and ready to go, so I went an entire day using it without realizing that no one could call me on it (something I learned when I came home from work to find Sky in a complete panic because he thought I was ignoring his calls). These two problems led me to call Verizon again. And again, and again, and again--in all, I talked with 6 different people and spent more than 9 hours over the course of one week trying to work out these two messes. On my fifth phone call, I learned that the person who signed me up had actually given me incorrect information regarding the pricing of my plan (something the first four phone associates AND the store associate failed to mention), and that I would not indeed get the promised discount. Since the discount was the whole reason I decided to switch in the first place, I tried pushing the issue. Whenever I expressed my frustration to the associate, however, he simply said, "I'm sorry to hear you received wrong information. I want to make sure you have correct information going forward." Apparently Verizon has been working hard to train employees in empathetic listening. Every person I talked to was indeed very sympathetic to my horrible luck (which their company manufactured), though no one ever seemed to care enough to actually FIX their mistakes. Screen shot from my chat with Riley at Verizon: "If I am the one to accept your frustrations, I certainly understand it. If this will let you express your disappointment about the matter, I am ready to listen...You can count on me." Here's the thing: empathetic listening doesn't help me if I am being misled and then overcharged. Baiting and switching consumers seems like a bad business model. Since I'd already changed carriers, I thought about waiting it out to see if Verizon's coverage was any better than my old carrier or if eventually they would get my bill right. But, then I decided I didn't need the stress. Verizon, like Comcast, has adopted a seemingly customer-friendly (but ultimately patronizing) approach to talking to us because they know they've made us mad by constantly changing rates and offering sub-par service. Only after I could finally extract myself from the clutches of the Comcast monopoly did I realize that well-run, customer-centered businesses don't need to sweet talk consumers. While I would have much preferred spending those 9+ hours hanging out with the kids or reading a book, at least I feel like I am growing as a person. Instead of sticking around to fight it out with Verizon, I decided to just walk away. That's progress for me! I'm glad to be back where the customer service staff is helpful and no one tries to make me feel better! Hopefully, this is the beginning of a long future of being able to find Ren when I'm looking for him. 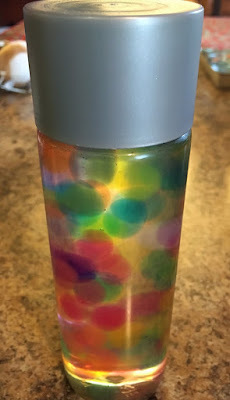 The water beads came in the mail on Tuesday. 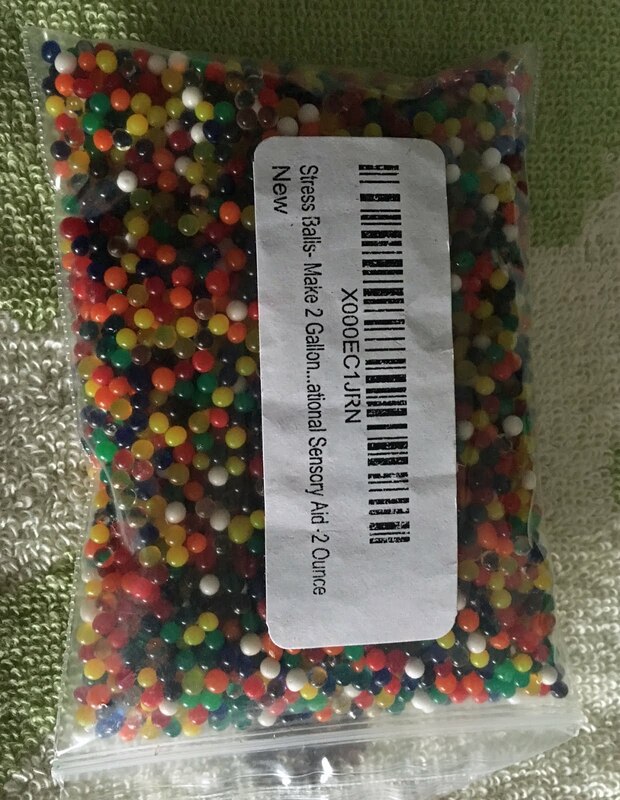 The description on Amazon assured me I could make two whole gallons of water beads. What arrived was a tiny ziplock bag full of balls approximately the size of a pin head. I can't tell you how happy I was to see they were called Stress Balls. The instructions noted that a single teaspoon of balls would yield a quart of filled water beads. So, I did the math. My fancy Voss bottles hold 11.5 ounces of water, and a quart is 32 ounces, so I needed to put enough beads to fill a third of a teaspoon. Easy. Except, a 1/3 of a teaspoon of beads was only, like, 10 tiny balls (or so it seemed to my giant eyeballs eyeing that giant Voss bottle). Surely, I needed to put more into the bottle. So, I upped the amount to 1/2 a teaspoon, and when that looked like it wasn't enough, I put in another 1/2 a teaspoon. Then I added water and the kids gathered around the bottle to watch the beads do their thing. The instructions said it would take 6-8 hours for the beads to fully hydrate, so after checking them at bedtime, I promptly forgot about them. The next morning, Pink came dashing in to see how they looked. They LOOKED cool, but no matter how much she shook the bottle, they didn't budge. Obviously, there were too many balls in the bottle. I took off the lid and about ten beads came shooting out onto the floor. After I dumped some more into a plastic bag for Stow to squeeze, I added more water. When all were sufficiently satisfied with the way the balls moved, I super glued the lid on. Hours later, when I got home from work, the balls were crammed together and stuck in place again. That's when I realized that my morning intervention had only provided enough space for the balls to keep growing. So, I pried off the lid and dumped out another 1/3 of the bottle, putting the newly freed balls into the plastic bag with the others. I added more water and glued the lid, leaving us with this. Oh, and a ziplock bag full of smashed stress balls. In the trash can. I guess the moral of this story is that I should probably just follow directions and trust my math. Sigh. Many months ago, several how-to pinteresty-type blog posts for DIY sensory calming bottles popped up on my Facebook feed. 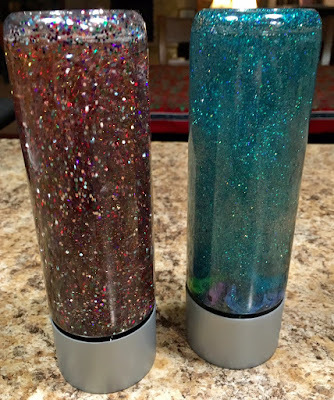 The bottles looked so fancy and so calming and so incredibly easy to make, so I resolved to make some for the kids....eventually. 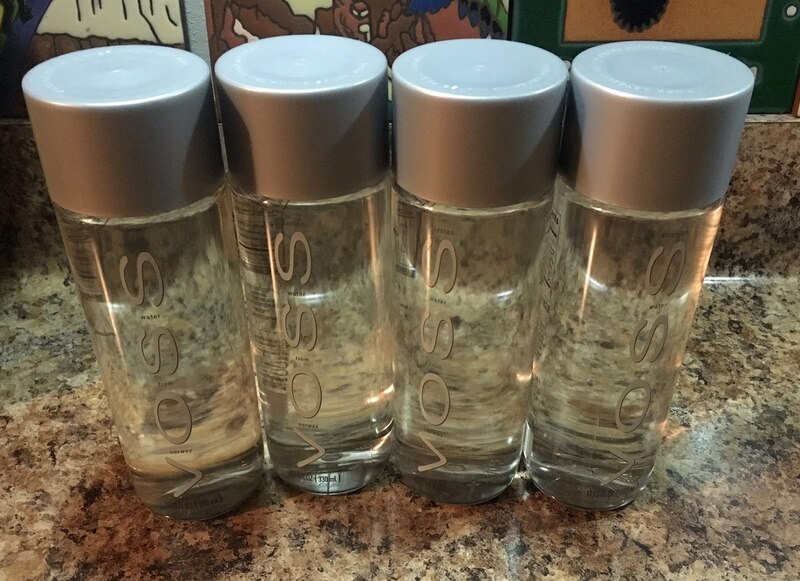 First, I had to acquire some "Voss" bottles. A rational person would have gone to her local grocery store to pick up a few of these bottles and just gotten the job done. But, I'm not rational. I'm also extremely forgetful. For months I forgot to check out the bottled water aisle when doing my grocery shopping. Then one day, a 12-pack of Voss water popped up on sale on my favorite online shopping site, so I bought it. Two days later, my twelve bottles of "artisan" water arrived. Ren was not impressed. In fact, Ren was downright hostile about the fact that I'd been so easily duped into paying a high price for water just because the packaging was pretty. I pointed out that I'd only paid 89 cents a bottle. This only confirmed his deepest regrets about my life choices. I thought about explaining the glitter and the glue and the little floating diamonds, but I knew he wouldn't understand. Soon, I had eight empty Voss bottles. But, the shape of the bottle and the narrowness of its neck made it difficult to dry them out (plus I'm forgetful), so they sat for days on the kitchen counter. It seems the Voss water on our kitchen counter and the empty bottles in the drying rack served as a constant reminder for Ren of my my gullibility. The last four Voss water bottles still sitting on the counter. Finally, all the pieces came together (in other words, I got 45 minutes to myself so I could run to the craft store and stock up on bottle fillers), and Pink and I made our first calming bottle. We used rainbow glitter glue, rainbow glitter, and about three tablespoons worth of clear Elmer's Glue. Then we super glued the lid on (and four of my fingers). Attempt #1--The glitter separates from the water and falls quickly to the bottom of the bottle. Pink and I deemed this attempt a success. 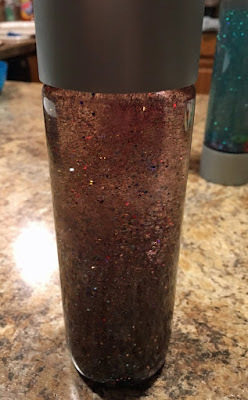 Sky pointed out that the large, coarse glitter was too heavy for the extremely fine glitter glue glitter, and that the whole thing flowed way too fast. Without using the precise word, he was talking about my problem with viscosity. So, when the kids went to bed, I tried again. This time I used two tubes of glitter glue and about 10 tablespoons of clear glue. I didn't use any of the coarse glitter, but I did add some plastic fish in an attempt to make it a sea-themed calming jar. The kids agreed that I got the viscosity right on this one, but no one was sure they liked how the plastic fish "swam" through the bottle. No matter how thickly I applied the glue, it couldn't slow them down. Attempts #1 and #2. side by side. 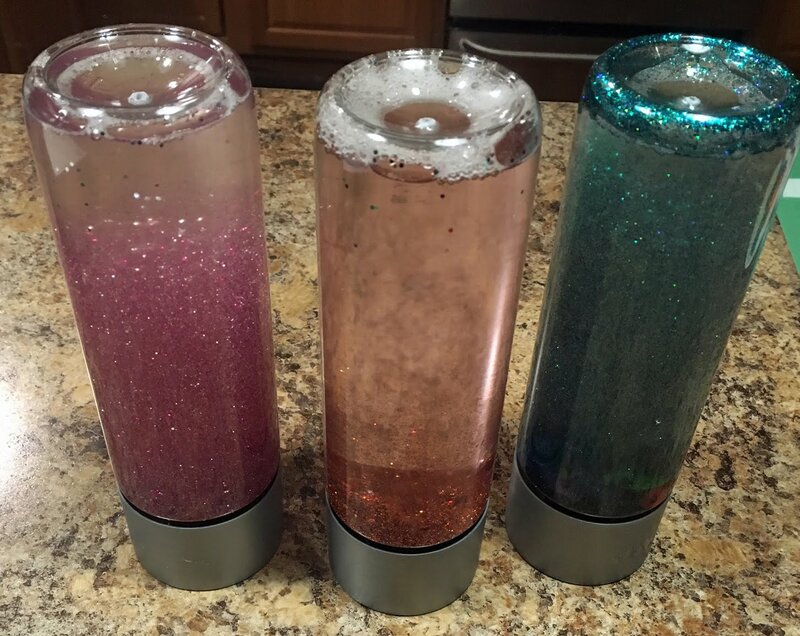 I decided to try smaller do dads together with two tubes of glitter glue, 8 table spoons of clear glue, and 1/4 of a container of coarse glitter. The letters work a little better than the fish, but they are still not light enough. The next time I get to the craft store, I think I will pick up some themed confetti to try. I'm still waiting on my water beads. They should come in the mail soon. 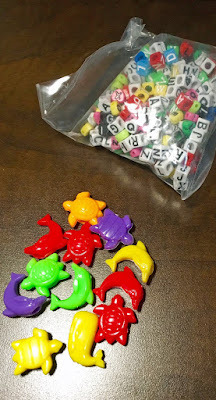 Big sea creatures and small letters. Both are still too big. Three of them with the same time lapse. The middle one is the least viscous while the green one has the most glue. Once I put these three bottles together, Ren FINALLY seemed to understand why I was willing to pay 89 cents for a bottle of water. And, in theory, these are a great idea. In practice, though, the small Voss bottles are ideal projectiles in the hands of a rambunctious 5 year-old. And Ren really, really, really hates glitter. I think we all know how this is going to end. Ren has already told me that he fully expects to replace all the carpet in the house when one of these bottles spills. Here's hoping these bottles have more going for them than their good looks!